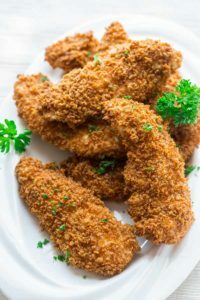 These heathy crispy chicken fingers are baked in the oven instead of frying. They’re breaded in panko mixed with seasoning and oil, then baked to make a super crispy coating. They’re kid approved! 1. Preheat oven to 400 degrees F. Coat a large baking sheet with cooking spray or brush lightly with oil. 2. Mix all-purpose flour with 1/4 teaspoon salt in a shallow dish. 3. Beat eggs in a second shallow dish. Set next to the flour. 4. Stir breadcrumbs, paprika, garlic powder and the remaining 1/4 teaspoon salt in a third shallow dish. Drizzle oil over the breadcrumb mixture and then mix thoroughly with a fork until all of the oil and spice coats the breadcrumbs. Set to the side of the egg mixture. 5. Use one hand for dry ingredients and one for wet ingredients while dredging the tenders. Dip a chicken tender in the flour mixture, turning to coat completely. Dip into the eggs, coating completely. Press into the breadcrumb mixture, turning to coat completely. Set on the prepared baking sheet. Continue with the remaining tenders one at a time. Discard any left-over dredging mixtures. 6. Transfer the baking sheet of breaded tenders into the oven and bake until the chicken is cooked through, 22 to 25 minutes.